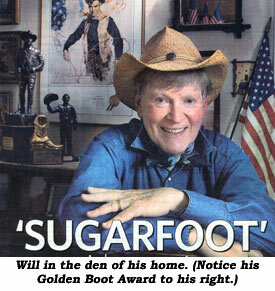 Will Hutchins on "Sugarfoot: Deadlock"
Howdy! 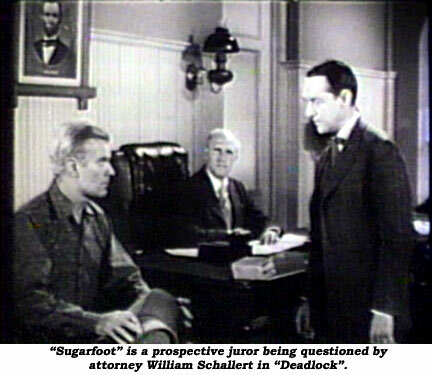 Boyd Magers has asked me to reminisce and ruminate about a “Sugarfoot” episode titled “Deadlock.” Arghhh! Longgg time ago. Research is out. Cobwebs in my brain, begone! Ahhh, a vision is forming. I remember—claustrophobia. Working on “Deadlock” we spent a good deal of time cooped up in a jury room. The show was sort of a poor man’s “Twelve Angry Men” with me as a second string Henry Fonda. The unlucky devil on trial was framed by the crooked politicos in town and most of the eight man jury (budget constraints, you know) was afraid to vote its conscience because of threatened reprisals. It was up to me, fledging itinerant mail order law student, to lecture the other seven on man’s inalienable right to a fair trial and to get them to come up with the proper verdict: Not Guilty. All that sweaty, smoky debate was followed by a sweaty, smoky punch-out at the local saloon, featuring baddies Dan Blocker (before he hit his bonanza) and John Vivyan (before he got lucky). The highlight of working on the show for me was fellow actor William Schallert’s telling raunchy jokes to a captive audience between takes. That’s the way I recollect the show. Wouldn’t swear to it in a court of law. At Warner Bros. they didn’t call me 20 takes Hutchins without reason. Nowadays, in Los Angeles, where the birds wake up in the morning and cough, the jury system is under serious, cynical scrutiny. Some folks want to do away with it altogether, but I say keep it. Being on a jury is one of the few ways we Americans can lend unfettered hands toward keeping our democracy in good running order. Some folks take delight in getting out of jury duty, but I don’t know why. It’s so darn much fun. I last worked on a jury at the L.A. County Courthouse. After we would-be jurors assembled, a Judge welcomed us. He said America is one of the few countries in the world to have a workable jury system. He said it’s far from perfect, but it’s the best there is. I got patriotic chills down my spine. I was rarin’ to go. It’s a different world down there at the courthouse. You feel you’re a vital cog in the workings of city government. You see things you’ve never seen before and meet people you’d never have met otherwise. The bailiff told me some citizens meet their mates pulling jury duty. Me? I met a fellow who invented a fool-proof method to win at the race track. After the trial we had a reunion at Hollywood Park. He showed me his system. At day’s end I lent him $20 to get home. Haven’t seen him since. Los Angeles is a crummy walking town. Too spread out from A to B with nothing much of interest in between. Except downtown. Downtown is made for walking. Hey, the Judge is giving us a long lunch break today. Come with me. Let’s walk the walk, unless you’d rather amble, mosey or saunter. It’s OK to inhale down here. Breezes waft and glorious fountains cleanse the air, giving it energy and excitement. Look how the folks dude-up. Sorta like New York. Whee! There’s a surprise ‘round every corner. Look, there’s City Hall. Used to be the tallest building in town. Now, it’s sort of a shrimp. As we walk isn’t it awe-inspiring to be surrounded by an asphalt jungle of old and new architecture? Here we are on good ole Broadway. Note the great palatial theatres of yore. My grandmother brought me here to see movies and vaudeville long ago in a golden age. Yonder is the criminal courts building where Le Cirque du O.J. played. Have you walked up an appetite?? Lunch is on me. What’ll it be? Chow mien, sukiyaki, tacos or what-have-you. Don’t you just love being a juror? I think jurying should be taught in schools so we approach it not just as an obligation but as an unforgettable experience we can all share. I read somewhere the best film critic is a Russian peasant. He leaves his baggage outside and enters the theatre child-like with a clear and open mind, heart, and soul. That’s the way we should enter the jury box. maybe I’m wrong about all this, but as Judge Leroy Bean used to say, “Them’s my findings...” Adios! 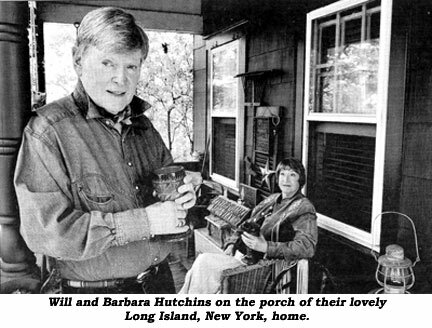 Will was interviewed at length by the Long Island NEWSDAY with a terrific spread appearing August 30, 2008.